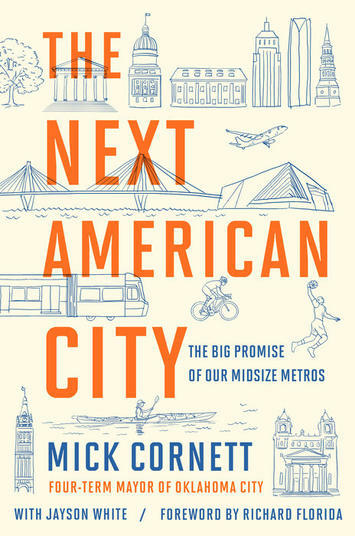 Later this month, former OKC Mayor Mick Cornett and I are set to release our new book The Next America City from Putnam Books. The product of Mayor Cornett's 14 years of leadership in Oklahoma City and 10 years of my own research on urban change and innovation, the work chronicles a major US trend well-known to readers of New Geography-- the movement of population, companies and ideas to cities once-forgotten in the national debate as much as left behind in the global economy. A favorite subject of this blog and website is also on center stage--the remarkable move of populations away from the coastal and cultural capitals that have suffered under the weight of their own success. Elsewhere on New Geography, and increasingly in broader research and media coverage, the outsize growth of sidelined cities is being noticed. No doubt, Wendell and Joel and New Geography will keep us up to date on how these trends are taking shape. But the upshot of The Next American City is perhaps less a description of what’s happening--or a prediction of what’s to come--than it is a reason to believe that the flourishing of a wide array of American metros is a goal our country should pursue. Cities like those mentioned above have often suffered major setbacks, whether from moments of economic calamity or major disasters. There is an art to a city’s recovery and reinvention--and the stories from New Orleans and Oklahoma City in The Next American City’s pages aim to tell these stories in an accessible and human way. If I could focus in on one key insight from the cities that have risen to national attention, attracted major companies or grown great startups of their own it is this: letting natural leaders work on the projects that capture their attention and passion. Those Millennial and Gen X leaders that have made their way to your city--or made a bold decision to stay--have a sense of what the market needs before demand has surfaced. It is critical to let those leaders lead. Jayson White serves as a Special Assistant to Oklahoma City Mayor Mick Cornett, building on nearly 10 years experience in urban innovation research and mayoral leadership in cities across the United States. In 2007, Jayson built and launched Harvard Kennedy School's Urban Policy Advisory Group — an executive session for Chiefs of Staff to mayors in the 50 largest and most creative cities in the country. Following his research at HKS, White has worked in several commercial real estate startups including Knotel, WeWork, and other key coworking and business incubation enterprises. His forthcoming book with Mayor Cornett (Penguin/RandomHouse, Fall '18) sheds light on the unique promise of urban creativity and growth in America's fast-growth, entrepreneur-driven small and medium cities.